Gutter Waunakee, Seamless Gutters | I.G.S. Has the time come to install new gutters on your home in Waunakee, Wisconsin? If so, then why bother with a subpar product when you can invest in Absolute Gutter instead? Made of a single piece of metal that is bent onsite immediately prior to being installed, this high-performance brand boasts an eye-catching seamless design. 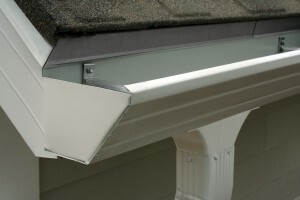 Even the end caps are wrapped from around the back of the gutter, producing clean corners and eliminating the need for any unsightly box or strip miters. This product has a unique design in that it is one inch lower in the front than it is in back. Should a clog ever develop, pooling rainwater will thus drain over the front of the system as opposed to submerging the roof and fascia. Absolute Gutter is built to hold 40 percent more rainwater than standard gutters. Available in three attractive face profiles, Absolute Gutter is guaranteed to look great on any home. Investing in a product like this one demonstrates that you are committed to not only protecting your home from rainwater damage but also to elevating its curb appeal. In short, this high-performance brand of seamless gutters simply works better and looks nicer than anything currently being offered by the competition. Developed by Innovative Gutter Solutions, LLC, it is available strictly from authorized installers who have received extensive product-specific training. Contact Innovative Gutter Solutions today to learn more and to be put in touch with an authorized installer of our seamless gutters serving Waunakee, WI.